Riddick (Vin Diesel in the Riddick movies). This here Lord Marshal’s profile. Base Of Operations: The Necromonger flagship, Necropolis. The Lord Marshal of the Necromongers was a skilled strategist and demagogue. Ripping people’s souls out of their bodies (in DC Heroes RPGH terms, Mystic Blast, Paralysis). Perceiving people behind him by projecting his astral form back-to-back with himself (Full Vision). Projecting his astral body to pull his physical body around at high speeds or to higher places (Superspeed, Jumping). The Lord Marshal was a dedicated warrior from a very early age. As a young man he received a prophecy that he would be killed by a Furyan, one of the warriors from the planet Furya. To forestall this demise, the warrior led a battle against the Furyans. He destroyed their world and killed every last one of them, as far as he knew. In time, the young man would become a Necromonger. The Necromongers were a death cult. Their primary tenet was that death was the Threshold beyond which was Underverse, a paradise of which the living world was only a pale reflection. However, Underverse was only open to true believers who fought to bring the gift of death to others until dying in their own due time. The death cult forbade reproduction, so every Necromonger was a convert. The warrior of this tale was no different and in time rose to the station of Lord Marshal, absolute leader of the Necromongers. After his ascension to supreme leader, the Lord Marshal traveled to the Threshold. It was not only a euphemism for death but apparently had a physical manifestation as well. There, the Lord Marshal became one of the Half-Dead, journeying through the Threshold and gaining superhuman abilities derived from manipulation of his own astral body. The Lord Marshal then led the Necromongers on a swath of conquest previously only dreamt of. The Necromongers laid waste to entire systems with their unrivaled fleet of space vessels. They overwhelmed each planet they came to by sheer numbers and then converted or killed the survivors. The conversion process was eased by demonstrations of the Lord Marshal’s abilities, which provided tangible proof to many people that the Marshal was touched by higher powers. After the Necromongers had replenished their ranks with converts they wiped out any remaining resistance. Then they would lay waste to the planet’s surface with their Conquest Icons so that nothing would ever live there again. The Lord Marshal would personally depress the trigger that activated the Conquest Icons from his command ship, Necropolis. When the Necromongers arrived at the Helion system, the fleet cut straight to the system’s capital world of Helion Prime. It conquered it in a single night despite the valiant efforts of the Helion militia. There the Lord Marshal met Riddick and attempted to convert him. During this process the Quasi-Dead Necromonger psychics discovered that Riddick was Furyan. 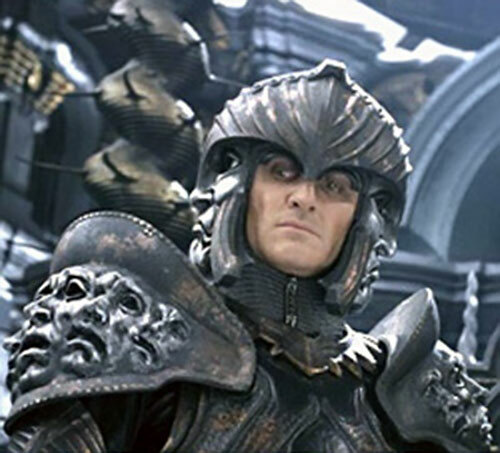 Fearing the prophecy of his youth, the Lord Marshal ordered Riddick killed. Riddick escaped and the Lord Marshal ordered a frigate of warriors to hunt him down. Riddick was tracked down and left for dead on the planet Crematoria. However, he was saved from that planet’s lethal sunrise by the Lord Marshal’s Purifier. Unknown to the Marshal, the Purifier had been a Furyan before his conversion. The Purifier had managed to break the brainwashing long enough to rescue Riddick. After giving Riddick a few useful bits of information, the Purifier walked into the deadly sunlight of Crematoria. He thus immolated himself before his conversion could retake its hold on him. 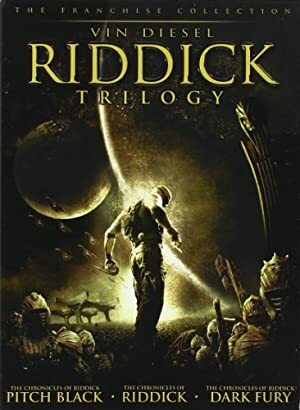 Riddick went after the Necromongers to save his friend Kyra. He infiltrated Necropolis and confronted the Lord Marshal, outraged after discovering that Kyra had already undergone conversion. Though Riddick put up a valiant struggle, the Lord Marshal’s superhuman abilities made him more than a match for the Furyan. The Lord Marshal knelt beside his fallen enemy and tried to tear out his soul. Though Riddick fought off the attack, it weakened the outlaw greatly. The Lord Marshal took an axe from one of the nearby sculptures and was about to plunge it into the helpless Riddick. But he was stabbed in the back by Kyra, who had broken her conversion for a moment to help Riddick just as the Purifier had earlier. The Marshal backhanded Kyra away, throwing her across the room to be fatally impaled on a set of decorative spikes. Weakened by Kyra’s blow, the Marshal asked his aide Vaako for help. Vaako instead picked up an axe and prepared to kill the Marshal. He was disappointed by his leader’s weakness and spurred by his wife’s scheming. The Marshal used his astral abilities to dodge Vaako’s swing… only to run right into Riddick’s waiting knife. Riddick slammed his blade into the Marshal’s skull all the way to the tang and then snapped the blade off, allowing the Marshal’s lifeless body to tumble to the ground. The Lord Marshal is a white male of average height and build, though his armor makes him look bulkier than average. He has dark eyes and patrician features, usually bearing a slight self-satisfied grin. All of the Lord Marshal’s powers involved projecting his astral body, which looks exactly like him except for being colored in silvery black-and-white tones. Such projections always looked as if the astral body were pulling itself free of its physical counterpart. They left a lingering silver wash behind it trailing back to the Lord Marshal’s physical body. This is the “silver thread” of legend. Or at least from the D&D astral travel spell. When the Lord Marshall took someone’s soul, an astral arm would pull away from his own. Then it moved through the victim’s body, pulling his soul with it (which itself resembled the victim in washed-out colors). When the Lord Marshal senses the approach of people behind him the face of his astral body would project out of the back of his head. Thus he would look at them without moving his head physically. The most dramatic display of the Lord Marshal’s mystic abilities was his superhuman speed. He would project his astral body outward at great speed, pulling his physical body behind it. He used this in combat to encircle his enemies in a silver whirlwind of motion as he pummeled them from multiple directions simultaneously. The Lord Marshal projected the supreme confidence of a man who is absolutely assured of his own continued success. He was convinced that he would be the Lord Marshal that finally led the whole of humanity to the Underverse. This belief was bolstered by his long string of victories leading the Necromongers. There were moments when one got the subtle impression that the Lord Marshal’s interest in completing the Necromongers’ work had as much to do with personal vanity and lust for power as it did with faith in the cause. Regardless of the reasons, his drive and skill were such that the Necromongers had become the largest threat to the galaxy under his command. There was only one thing that could shake the Lord Marshal’s self-assured bearing — the threat of the Furyans. The prophecy he’d received shaped much of his life. Any suggestion that a Furyan still existed pushed the Lord Marshal to vigorously pursue and end that threat. However, he was prudent enough to send others before him to eliminate such dangers so as not to tempt fate by getting close to a Furyan. The Lord Marshal has a fondness for large sculptures depicting slightly warped and twisted human bodies in the throes of various agonies. As a result, much of the inner architecture of the Necromonger flagship Necropolis is liberally adorned with such artworks. It also has complementary features such as rows of spikes running up support columns. The Lord Marshal’s artistic bent extended to his strategy. He would at times overrule the typical brute force approaches advocated by his advisors in favor of more symbolic, elegant martial plans. The Lord Marshal also demonstrated and appreciated a flair for the dramatic. While none dared to speak publicly against him, some of the Necromonger lords saw this artistic streak as a weakness in the Lord Marshal’s character unbefitting to a warrior. The Lord Marshal and his Necromongers could emerge almost anywhere in the DCU. They could come from space either as a modern-day threat or plague the LSH era in the same way that the Dark Circle did. 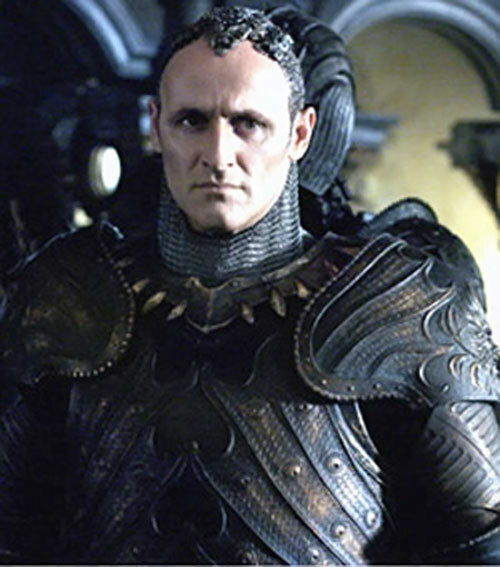 The Lord Marshal might also be encountered as a metahuman cult leader of Earthly origin, perhaps in competition with Baron Blood, Kobra, or R’as al Ghul. Mystic Blast has a Range of Touch, using DEX for AV (-1FC). Paralysis is a combined Dice Action with Mystic Blast (+1FC each). Paralysis only lasts 1 phase — maintaining Paralysis requires another successful Mystical Blast each round (-2FC). Superspeed can only be used to replace Movement Speed, DEX or hand-to-hand EV (-3FC). Superspeed only allows a maximum Movement Speed of 7 APs (-1FC). Credentials (Necromongers, High — Rank: Lord Marshal), Lightning Reflexes, Iron Nerves, Expertise (Planetary assaults). Authority Figure (Necromongers), MIF (His prophesied death at the hands of a Furyan). Superspeed with Limitations was used instead of a higher Martial Artist and Running because AV and OV seemed to be elevated simultaneously by his blurring speed (which wouldn’t be possible with Martial Artist) and because it was a Power and should be Neutralizable. Artist Skill is based on the implication that he was the designer of much of the Necromongers’ current aesthetic motif. Source of Character: Chronicles of Riddick (movie).